Copper high quality statue with 'cold' gold painted face,and decorated with turqoise and coral coloured stones.Easily assembled from three seperately moulded parts. 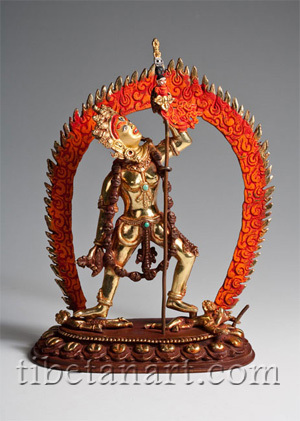 Vajra Yogini symbolizes the female tantric aspect of the Enlightened mind, embodying the union of bliss and emptiness. 9 inches high.This statue depicts Naropa's Vision of Vajrayogini: her two feet treading upon the bodies of Kalarati and Bharava, holding a skull cup, knife and khatvanga while gazing upwards to Kechara Paradise, she stands within an aura of blazing fire.